On Thursday, September 20, we celebrated 83 faculty and staff service anniversaries. Besides the incredible number of honorees, this year’s awards were notable for another reason: we presented them on their own day during opening week. This gave us an opportunity to include the entire board of trustees as well as giving our honorees an even that was entirely dedicated to them. We’ve included a few photos of some of this year’s winners along with the full listings below! Thank you to our recipients for your years of service to education! Thanks, as well, to the Conference Services and Media Services crews for helping make this year’s event truly memorable. September is an exciting month for our college for many reasons. Why am I talking about September when it’s only May, you say? It’s my time to coordinate the recipients for Service Awards. My favorite time of year. No, really! We count years of service from the first day of permanent employment. For instance, if you were an adjunct or hourly employee before becoming a permanent employee (classified, exempt or tenure track faculty) we begin counting from the start date of your permanent position. If an employee leaves Green River and is rehired, we combine the years of service. Presentation of service awards will be on Opening Day in September. 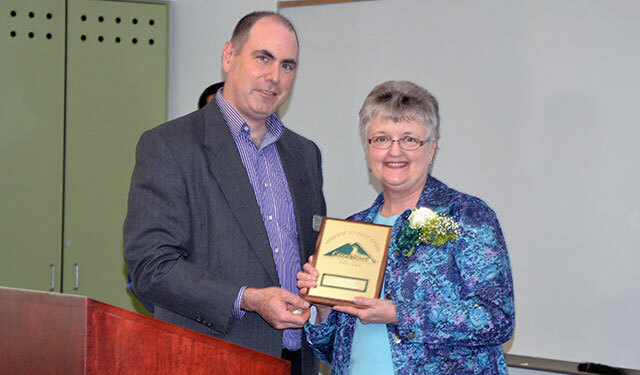 Over fifty employees will be honored with awards for years of dedicated service to Green River College, ranging from five to forty-five years. 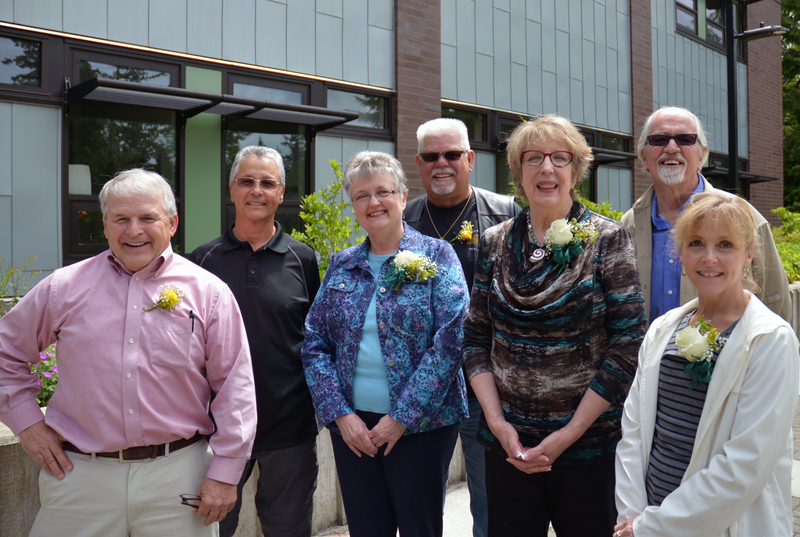 Last Wednesday, June 3rd, Green River honored its most recent retirees. Current and past staff and faculty came together to celebrate their combined total of 361 years of service at our college. The audience applauded the retirees as they received their service plaques and pins, and listened as they spoke proudly about their time at Green River. Naturally, their stories differed from department to department, but every retiree, whether a former instructor or staff member, expressed immense gratitude for the relationships they had developed at the college. With comments ranging from, “Coming to Green River was the best decision I made,” to “This College is like no other,” it was easy to be reminded of the special nature of our school and to be infected with their pride. Many thanks to Josh Gerstman from the Green River Foundation, Patty Sherman and Benita Walters from Conference Services, Julie Spears from Marketing and Communications, Jean Sheadel from College Relations, Steve Sosa, Kirk Walker, Claire Gorenstein and Jessica Tichy from Human Resources, Suzanne McCudden from the President’s Office, and Natalie Edwards from Campus Safety.